When you are young, your grandparents try to tell you their history, and you don't care because it doesn't interest you at the time. Later on you wish you had written what they said down. This life changing book is the gift we must give to our parents and grandparents that becomes a cherished and priceless family heirloom. Inside are questions to spark the memories of THEIR lives, to surprise them by joy! Get to know and laugh with them. Hear their stories and memories, and honor their lives by writing them down for future generations in this 8.5 x 11 inch family history memoir. With every other page being blank, there is plenty of extra space for their enhanced stories or attaching photos. They will love it! The written words become windows to a parent and grandparent's heart. You can instantly send (the most thoughtful gift that GIVES BACK) by selecting Gift-wrap. Story titles include... Chapter 1. In The Beginning How, when, and why did your ancestors first come to this country? When and where were you born? What is the most important lesson your parents taught you? How many children were in your family? Where were you in the lineup? What were the names of your grandparents? What do you remember about them? Generally speaking, what was your childhood like? What stories do you remember most clearly about your childhood? Chapter 2. School Days What was it like where you grew up? What were your favorite childhood games? What was your favorite subject in high school and why? What were your schools like and how did you like school? Did you attend any school or training after high school? If so, what was your field of study? Do you have a college degree(s)? Are there any particularly happy, funny, sad or instructive lessons you learned while growing up? Chapter 3. Off To Work What did you want to be when you grew up? What was your first job and how did you get it? What was your first boss like? What did you learn from him or her? What jobs have you had? How did you decide on a career? Were you ever out of work for a long time? If so, how did you handle that? Plus these additional story titles... Chapter 4. Romance and Marriage Chapter 5. Leisure and Travel Chapter 6. Religious Tradition Chapter 7. War and Peace Chapter 8. Triumph and Tragedy Chapter 9. Words of Wisdom Chapter 10. Funny Bones Chapter 11. Gratitude Family history is about strengthening family ties through the generations. The perfect gift that GIVES BACK for mom, dad, grandma and grandpa for their birthday, anniversary or holidays. The written words become windows to a parent and grandparent's heart. By sharing this gift for all ages, you can be the personal creations expert in the field of uncommon goods and your children will be blessed! This celebration of life is among the American history best sellers nonfiction books on sale. This book is aimed at grandparents, older adults who have already completed the milestones listed in this book. But it can be an equally valuable resource for a child who is just starting to contemplate life as an adult and is unaware of the millions of possibilities of adult life. You could even train giraffes for a circus act or raise giraffes for draft animals or maybe train giraffes to trim tree tops into topiary, even if nobody has ever done it before in the whole history of the world, if you discovered young enough that you love giraffes more than any thing else in the whole world. But if you plan to do something that nobody has ever done, it helps to start early. You can start doing little things about what you love, no matter how young you are, if you know some things that you love, like giraffes, even if you do not know of any jobs with giraffes, or if you only know about a job with giraffes that you would not love, like being a zookeeper of giraffes in a nearby noisy crowded zoo where the giraffes are worried or sad or maybe frightened. You want a job with giraffes that are happy and proud of what the giraffes can do better than any other animals, even people, but you do not yet know about jobs that people need done that giraffes will be good at and be happy doing. If you are eight years old you have time to try to find out if there is something that is good for you and good for giraffes. Maybe you start by learning about people learning about using goats to clear weeds out of fields. Then you find out that there is a woman in your town who has a job with goats of her own that clear weeds out of lawns, pastures, golf courses, and even cemeteries. You get her phone number, call her up, and ask a million questions. She invites you to come to a place that she is working this Saturday. You go, and are helpful, and she offers to pay you to help her with the goats every Saturday and even if goats are not as cool as giraffes, this seems like a good start at getting your dream job. And twenty years later you are a world famous expert on what makes giraffes happy, and you train giraffes and goats, because giraffes like goats, and goats are easier to train, so the goats help you train giraffes. You wrote the whole story of how you learned to become a famous giraffes trainer as it happened, as a gift to future generations of giraffes trainers. And now giraffes around the world lead happier lives, because every giraffes trainer knows what makes giraffes happy. Of course, if you want a job that already exists, and you start thinking about what makes you happy when you are young, this is even easier. But even if you want a job that has never even been thought of before, there may be a way to create that job. Or you might decide that you like goats best, and find a special job with goats. Either one is good it is good for you. Only you can know about what makes you and the goats and the giraffes happy. But if you write your life story, other children like you will know that it is possible to make a living from making animals happy. That is a gift to them that is more important than rubies. A nice resource, but way overpriced. It is very short and there is no design or even different sized fonts on the pages. It just looks like a Word document I could have printed off at home. 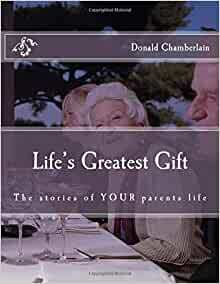 Even so, I think it is nice to have to give to parents as a gift to record their lives for their grandchildren. It is currently $9.70 on Amazon, I would say it is worth about $4.99 especially if you plan to buy four (one for each of your children's grandparents). The number of questions and the types of questions seem just right. If this were hardcover and had more space to write the answer to each question and were formatted beautifully, it would be worth the money and worthy of being a family heirloom.